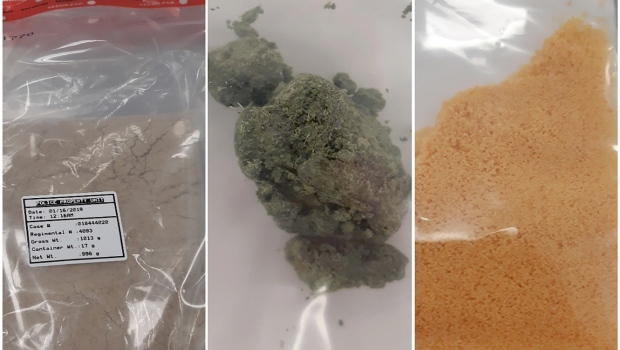 Calgary police seized powdered fentnayl, left, a green substance later found to be a mixture of fentanyl, benzodiazepine and caffeine, centre, and a Class A precursor commonly used to manufacture fentanyl. The Guns and Gangs Unit identified a suspect believed to be trafficking drugs in the city in late 2018 and launched an investigation. 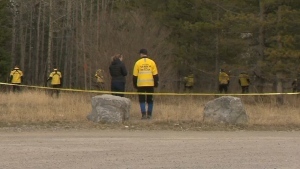 That led to a traffic stop in January just outside Canmore, where a search of the vehicle revealed 2.2 pounds of powdered fentanyl along with 4.5 grams of a green substance later determined to be a mixture of fentanyl, benzodiazepine and caffeine, and another 11 grams of a Class A precursor commonly used to manufacture fentanyl. Police also seized a small amount of money and numerous cell phones. Detectives had the seized drugs analyzed and said the powdered fentanyl was found to be 10 to 15 times more potent than what is typically sold at the street level in western Canada. A search warrant was served Wednesday at a home in the 0-100 block of Rosery Drive N.W. and a man was taken into custody. Three counts of possession of a controlled substance for the purpose of trafficking. One count of possession of a precursor for use in the production of a controlled substance. Sunstrum is schedule to appear in court next on May 10. “The fentanyl seized in this investigation had the potential to cause significant harm to our community and could have resulted in countless deaths,” said Staff Sgt. Greg Cooper of the Guns and Gangs Unit in a release. Sunstrum ran for mayor in the 2007 and 2013 civic elections in Calgary, garnering less than 2,000 votes each time.